Eclectic 160012 Automotive Goop Contact Adhesive and Sealant is the strongest single component adhesive. Bonds to metal, glass, plastic, vinyl, and leather and seals convertible tops. Fixes seats, mats, lights, mirrors, handles, trim. withstands heat up to 150F. 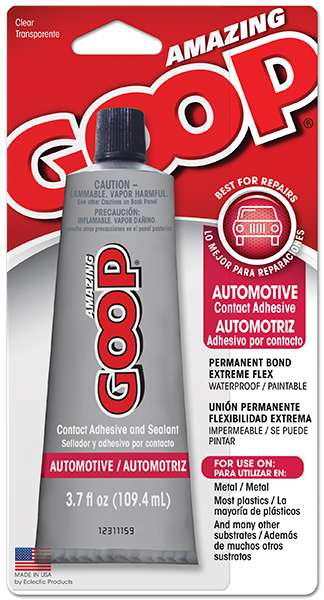 Automotive Goop Contact Adhesive & Sealant Repairs vinyl rears on car seats, floor mats, and convertible tops. Maintains its powerful bond to seal leaks in hoses, vibration-proof screw connections. More effective than silicone for protecting battery terminals against corrosion, sealing windshields and headlights. Insulates electrical wiring and even mends torn speaker cones. Holds emblems and side molding strips in place. Eclectic Automotive Goop Contact Adhesive & Sealant Features: Super sealant for the auto, inside and out Repairs vinyl tears on car seats, floor mats, and convertible tops Maintains powerful bond to seal leaks in hoses, tread, more effective than silicone for protecting battery terminals against corrosion, sealing windshields and headlights Insulate electrical wiring Sticks emblems and side molding strips in place.